This is the moment a couple took their romance to new heights by exchanging vows – on a tightrope 25 metres off the ground. 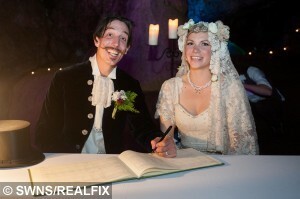 Chris Bull – in full morning suit – and Phoebe Baker – in a flowing white wedding dress – started from opposite ends of the 75 metre-long highwire before meeting in the middle. 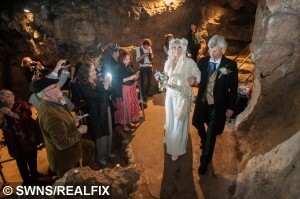 They then said ‘I do’ over the heads of around 100 friends and family watching on from the ground at Wookey Hole in Somerset. 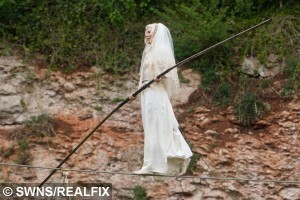 The event – billed as the UK’s first-ever highwire wedding – was always on the cards for the daredevil couple. 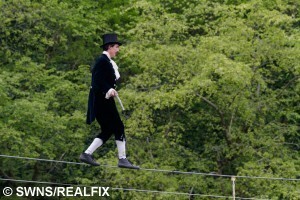 Chris, 37, a professional rope walker, fell for Chloe, 25, at a circus show where she was a costume designer. The ceremony was so unusual that signing the marriage certificate wasn’t actually legal up in the air and they had to sign it on the ground before heading up. The wedding, which took place on May 1st, needed a full dress rehearsal beforehand to ensure everything went off without a hitch. Chris, who lives with Phoebe in an original 1930s showman’s caravan in Hanham, Bristol said: “I’ve been a rope walker for 12 years and it was something I’d always dreamt of. “I never thought I’d find a wife to agree but I proposed to Phoebe in Burma and one of the first conversations we had about it was me saying how cool it would be to get married on a high wire. “She thought it was a crazy idea but to my surprise she actually said she’d be up for it. “Phoebe had been developing her skills on a low wire at the time so we decided with some more practise we’d give it a go. The marriage was conducted by Chris’ pal, who is a ringmaster ordained to marry people, from the ground using a megaphone. Circus showman Gerry agreed to host the highwire wedding after Chris read his autobiography and emailed him asking if he could help stage it. Chris added: “It was a dream come true and Gerry was 100 per cent behind the idea, helping us with rigging and planning. Phoebe said: “This is Chris and I all over. “My mum was slightly nervous at the thought of the idea first of all, but we agreed to install a safety wire at her request so she was fine in the end. Wookey Hole is one of the largest cave systems in Europe and runs a Circus School for children so much of the equipment needed was already in place. 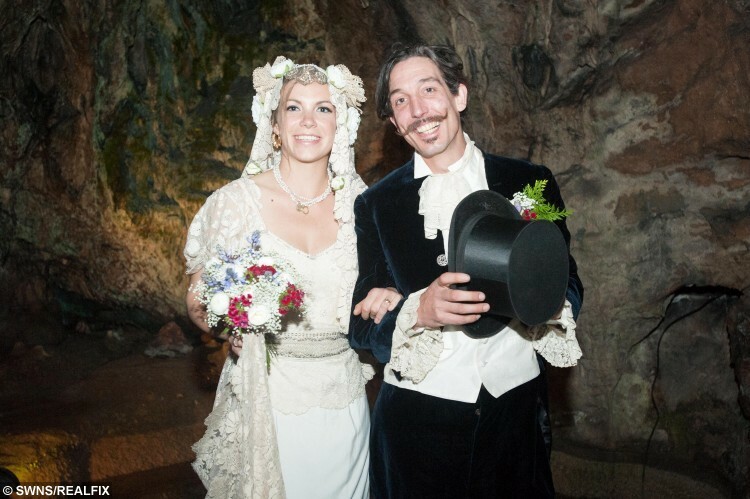 Joint-owner and director Daniel Medley said: “We’ve held several weddings at Wookey Hole in the caves themselves but never any as ambitious and unique as Chris and Phoebe’s.